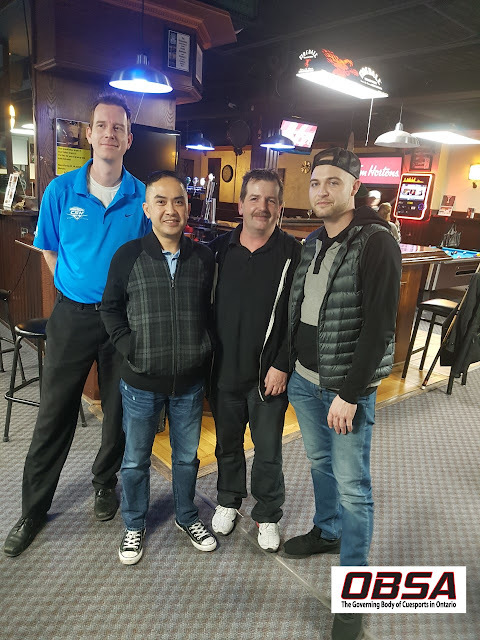 Canadian News : OBSA Results: Non Handicap Pool Returns to GTA! OBSA Results: Non Handicap Pool Returns to GTA! This past weekend marked the first event of the newly formed OBSA (Ontario Billiard & Snooker Association) open tour. A non handicapped open tour has been a long time coming for the pool scene in Ontario. In year one five rooms have banded together hosting one event each from all regions of Ontario. Stop number one was at Petrinas, The Corner Bank, Tony's, Strokers and On the Snap will also be holding events over the next few months. The tour is full dress code, winner breaks, 9 ball on the spot, race to 9 on the winners side and race to 7 on the losers side with a one set final race to 11. 20 players showed up for the first event which was 500 added. A couple faces that we haven't seen in years were in attendance such as Raymond Cruz and Eric Hildebrand along with strong semi pro players Ben Crawley and Barry Hetherington. Staggered entry fees encouraging participation from lower ranks were offered as well as prizes for the highest finishing A and AA players. Jamie McKeen a much improved player in recent months made his presence felt with a win over semi pro Ben Crawley in the second round and forced a hill hill battle in the third round before falling to Eric Hildebrand. Jay Goyer a strong and experienced player from Kingston made his way through to the winners side semi final where he had a close match with Raymond Cruz losing 9-6. In the other winners side semi final I played Eric Hildebrand who showed that his game is still sharp despite not playing much in recent years, I was able to slide by with a 9-6 win. In the winners side final the match was tied at 4 all and from there I got a good break going in this winner breaks format going on to win the match 9-4. As the B side progressed Hildebrand came back to play Cruz in the losers side final, these two old foes had a close match with Cruz edging out Hildebrand by a 7-5 scoreline. In the final I started with more good offensive play breaking and running most of the racks on my way to a 6-0 lead from there Cruz wasn't able to mount any offensive charge and I took the match 11-5. I would like to stress that events like these are vital to promoting player development in Ontario. The amount that handicap play has become prevalent in Ontario and the recent exclusion of top players is something that will severely hurt the quality of players coming out of Toronto in the future. Congrats to the OBSA for making an effort to turn things back in the right direction and congrats to the 20 players that showed up to measure their game against the best. I can guarantee that players participating in this series will see an overall long term improvement in their game.